The renaissance of English music goes on unabated and this issue is a testament to the advocacy of the small private companies towards this particular musical heritage. York Bowen was born in London in 1884 and enjoyed an excellent reputation in his day and he was also highly regarded and supported by such prominent characters as Henry Wood and Hans Richter. His output is very notable particularly in the piano and chamber fields. He also composed quite a fair amount of symphonic works including 4 symphonies, the alst of which existed only in short score. A landmark in Bowen's career was the first ever recording of Beethoven's Piano Concerto #4 made in 1926. Bit by bit though, his music started to fall out of fashion and by the time of his death in 1961, he was largely forgotten. 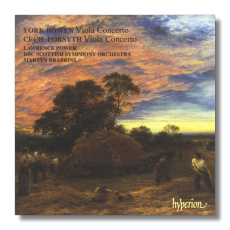 It is only of late that his wonderful music is re-emerging again and this Viola Concerto is a most welcome discovery which will certainly do no harm to Bowen's reputation. The Concerto is written on an expansive scale and has moments of extreme virtuosity complimented by dramatic orchestral 'tutti'. The Andante Cantabile amply betrays Bowen's good nature and his innate penchant for sweet songlike tunes, while the Allegro scherzando reveals the composer in a mature and witty light. A very rare but brilliant work written in celebration of the 'viola as a virtuoso'. Cecil Forsyth was born in Greenwich in 1870 and he is a complete novelty to me. His early career was as impressive as Bowen's but after this youthful promise, he emigrated to America in 1914 and died in New York in 1941. His compositions number many songs, two comic operas, some orchestral works, including the Concerto on this disc and a handful of instrumental miniatures. He also wrote several books on the diverse aspects of music. This Viola Concerto was premièred on the 12th of September 1903 and is considered to be the first full scale Viola Concerto by a British composer. Contrary to Bowen's, his music never commanded a place of importance and after he went to America he was quickly forgotten. The concerto has a strongly lyrical solo part punctuated by powerful tunes that are thrown in between violin and orchestra, giving an overall impression of inexhaustible good humour. Lawrence Power is a very young virtuoso (b. 1977) but from what I heard, his acute musical sense and disarming versatility have already attained levels of bewildering maturity. The performances he delivers are a testimony to his passion for the viola and string instruments in general. Martyn Brabbins and the BBC Scottish Symphony Orchestra give a polished performance and their support is both illuminative and sympathetic. A memorable disc that is enriched with excellent notes and feasty artwork.